alaTest a collecté et analysé 116 avis de consommateurs et d'experts pour le produit Kogan Agora. La note moyenne du produit est 2.9 sur 5, tandis que les autres Téléphones Portables ont une note moyenne de 4.1 sur 5. Les testeurs apprécient la batterie. Le rapport qualité/prix impressionne, mais de nombreux avis sont moins positifs sur le son. Après analyse des notes de consommateurs et d'experts, de l'âge du produit ainsi que d'autres facteurs, et comparé aux autres Téléphones Portables, le Kogan Agora obtient un alaScore™ de 87/100 = Très Bien. While the Kogan Agora will deliver most of what it promises, it has a poor quality display, terrible battery life and often sluggish performance. It also doesn't appear to work on the 850MHz 3G network band in Australia, despite being advertised as such. A big-screen Android smartphone at a rock-bottom price. Last year saw Aussie e-tailer Kogan release its quad-core Agora phone , the first in Australia to retail for under AU$200, with equally low price tags in other markets: $189 in the US and £149 in the UK. 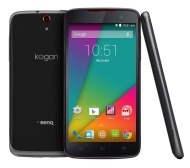 The Kogan Agora 4G has solid quad-core performance, 4G connectivity, and a surprisingly stylish design, all at a bargain basement price. Sadly the camera is also bargain basement and the screen is a little dull, with poor visibility in sunlight. Will the marketplace snap up this budget 4G phone? Double the power, but double the performance? There is a lot to like about the Agora smartphone beyond its bargain-bin price tag. Kogan has excelled at creating a product which is so full-featured on a budget, even if some of these features don't perform as you might expect them to. How does Ice Cream Sandwich taste in a bargain tablet? Australian technology company Kogan has built its success on creating cheap but functional products that offer an alternative to premium priced brand names.